Making your own vegetable spaghetti sauce from scratch is not only super easy but delicious and healthy too! You get to put whatever veggie you prefer and know the ingredients are healthy and fresh. Plus you can flavor it as you like, be it with garlic or herbs or a combination of both. 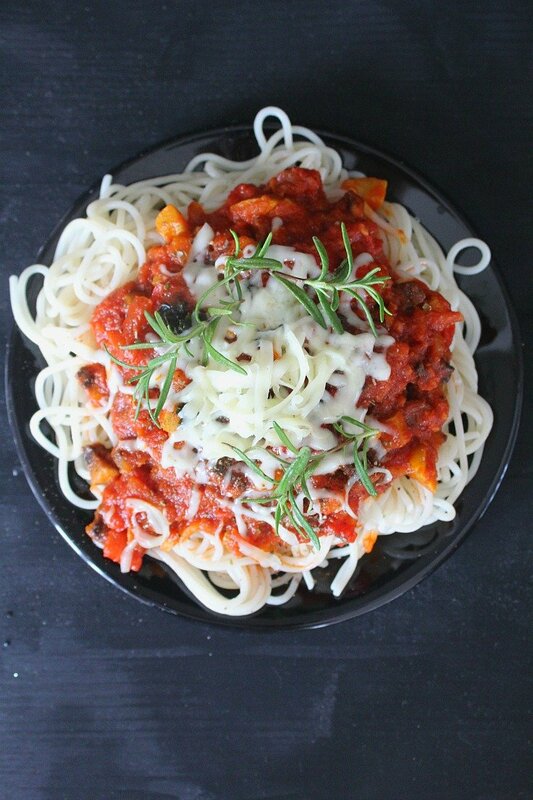 Add your favorite cheese and you’re in for a lip smacking dinner recipe in no time. We love pasta but we make macaroni and cheese pudding more often and occasionally, milk soup with elbow macaroni. But I’ve realized we’ve been lacking veggies in our diet lately so I’m looking for ways to incorporate more vegetables and please my picky eater too. 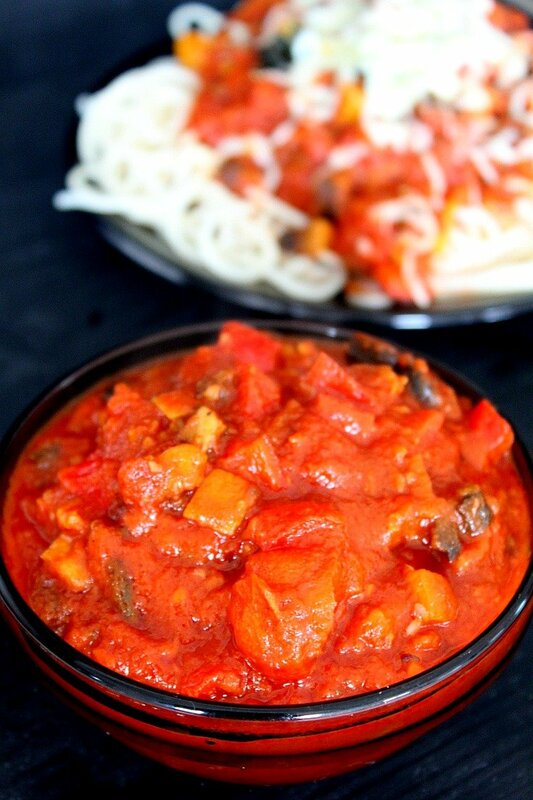 And this veggie spaghetti sauce is the perfect choice! If you’re dealing with one yourself you know what a gigantic work is to make them eat healthy. She always loved mushrooms and recently she learned red peppers taste really sweet and delicious (bell peppers or sweet long peppers are her choice). So I decided to base my vegetable spaghetti sauce on these two ingredients and sneak in a bit of onions (which she actually hates), some zucchini (another “blah” veggie) and garlic (which she says is only good as a character in Hotel Transylvania; gotta appreciate her sense of humor though). I loaded my homemade veggie spaghetti sauce with lots of diced tomatoes and canned tomato sauce and flavored it with oregano, basil (which is always such a great match for any pasta recipe) and a bit of salt and pepper. 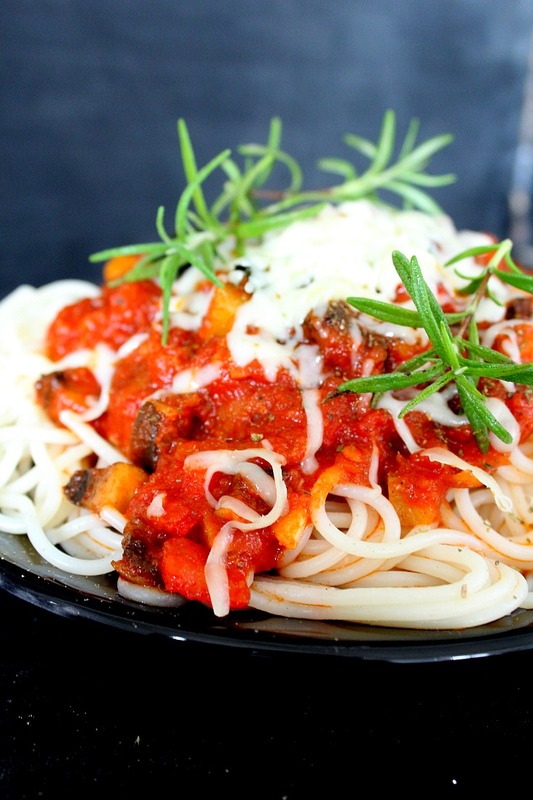 The best thing is that this vegetable spaghetti sauce can be kept in the freezer for later if you happen to make more than you need. I made this vegetarian spaghetti sauce to feed our family of 3, with daddy eating for two and Ellie and I eating like little birds. If you think your family fits the bill go ahead and just follow the instructions below if not, adjust accordingly.